An original letter of correspondence between Joshua Coffin Chase and S. M. Crowell, a laborer at Isleworth Grove. Topics discussed in the letter include instructions to obtain padlocks to use on gates in case of breakage and a reward for the detection and conviction of any individual breaking in to Isleworth Grove. Original letter from Joshua Coffin Chase to S. M. Crowell, April 23, 1931: box 49, folder 20.84, Chase Collection (MS 14), Special and Area Studies Collections, George A. Smathers Libraries, University of Florida, Gainesville, Florida. 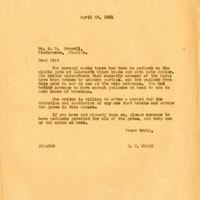 Digital reproduction of original letter from Joshua Coffin Chase to S. M. Crowell, April 23, 1931. For several weeks there has been no padlock on the middle gate at Isleworth which leads out onto Lake Butler. The writer understands that recently several of the locks have been broken by unknown parties, and the padlock from this gate is now in use at the main entrance. You had better arrange to have enough padlocks on hand to use in such cases of breakage. the writer is willing to offer a reward for the detection and conviction of any one that breaks and enters the grove in this manner. If you have not already done so, please arrange to have padlocks provided for all of the gates, and keep one or two extra on hand. Chase, Joshua Coffin. 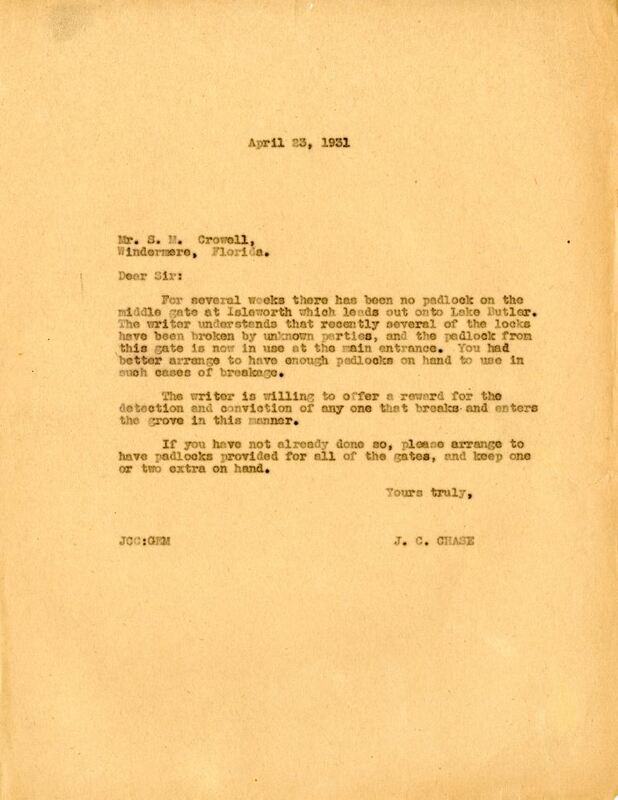 “Letter from Joshua Coffin Chase to S. M. Crowell (April 23, 1931).” RICHES of Central Florida accessed April 18, 2019, https://richesmi.cah.ucf.edu/omeka/items/show/2755.